This standard studio features a dining table, a microwave, fridge, toaster and tea and coffee making facilities. En suite bathroom features a shower with complimentary toiletries. This twin studio features a dining table, a microwave, fridge, toaster and tea and coffee making facilities. En suite bathroom features a shower with complimentary toiletries. This studio features a kitchenette with a stovetop, microwave, toaster, tea/coffee supplies and kitchenware. En suite bathroom features a shower with complimentary toiletries. The 1-bedroom apartment features a refurbished kitchen with a stove top, microwave, refrigerator, toaster and tea/coffee making facilities. There is a super king bed in the main room and 2 singles in the bedroom. This family room has a kitchenette which offers a stove top, microwave, toaster and kitchenware. The En suite bathroom features a shower with complimentary toiletries. 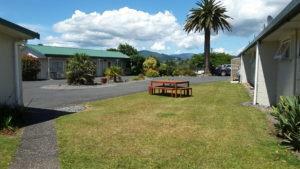 Palm Motel Waihi provides a range of amenities for the comfort and convenience of our guests ensuring your stay with us is comfortable and enjoyable. Convenient onsite parking, SKY TV, a Swimming Pool (Summer Months), SPA Pool and Gas BBQ’s for the exclusive use of guests. We have play area that includes a trampoline and provide secure bike storage.